It is interesting how certain thoughts align when prompted by particular events. There has been controversial discussion of late regarding the High Speed rail link to connect the South of England with the Midlands, as part of what is referred to as a 'regeneration' of the area. Some question the validity of the project, others what will inevitably be the spiralling cost. Before this became headline news I happen to travel through Birmingham by rail for the first time in many a year and was struck by one overwhelming feature, the sheer dereliction around Birmingham New street and Wolverhampton & Dudley. It was staggering. As I passed one barren waste land and derelict factory after another one building in particular caught my eye immediately, which epitomised the demise of what was once one of the most powerful Industrial regions in the world. William Butler's Springfield Brewery was founded during this Industrial zenith in 1873 when Wolverhampton, along with several other towns of the Midlands, were employing thousands in their factories and mills and became known as the 'Workshop of the Empire'. They exported vast quantities on a global scale where heavy manual labour, and all its rigours, were part of a daily grind. Breweries therefore were seen as providing what was considered then essential nutrients for the daily diet, but more immediately slaking the thirsts of those who toiled. 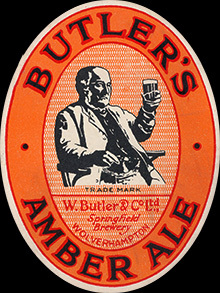 William Butler's Brewery thrived during the late Victorian era and early 20th Century, but fell victim to the merger mania that griped the brewing industry during the early 1960's. It was purchased by the Mitchells & Butlers Brewery of Birmingham in 1960 and eventually ceased brewing, becoming a distribution depot for the parent company. The site was eventually closed and a disastrous fire in 2004 destroyed much of the Victorian interior. The site is now privately owned and there are plans to revitalise it eventually in a commercial or business role. Let's hope they reach fruition and breath life back into a building what was once a powerful symbol of local pride. The profusion of new micro breweries in the UK is of course going some way in restoring the percentage of the loss of such breweries in the modern age, but this was a time when architectural grandeur was a statement of intent and awe, when the brewery was the most significant presence at the heart of a community, and had a loyalty unmatched by any other industry. 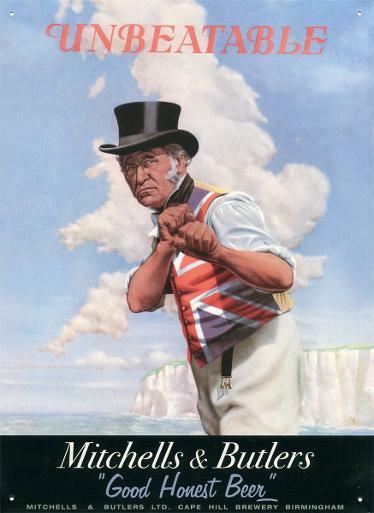 Such was this unity that the brewery would become synonymous with the town or city itself, and mentioned in one breath, such as Fuller's of Chiswick or Harvey's of Lewis today. What is clear is that the area around Wolverhampton and Birmingham are badly in need of regeneration with swathes of land lying barren.